Let’s face it—if your team’s not playing, the Big Game becomes less about the sports and more about the snacks. Sure, the Birds lost, but that’s no excuse to eat your feelings. Before you go delving into a high-fat, junk food spread, consider adding some healthy options to your plate instead (like any of the seven guilt-free bites below!). Bring your snacking A-game with these protein-packed, hearty and healthy snacks—guaranteed to keep you full and happy all four quarters. Ah, the ultimate football comfort food—chili. A game day gathering without it is a total party foul. But did you know that by using ground turkey or 95 percent lean beef, in place of traditional ground beef, you’ll shave off 7 grams of fat and at least 59 calories per serving? Make sure to pack in the beans as well. They’re full of fiber and will keep you feeling fuller, longer. 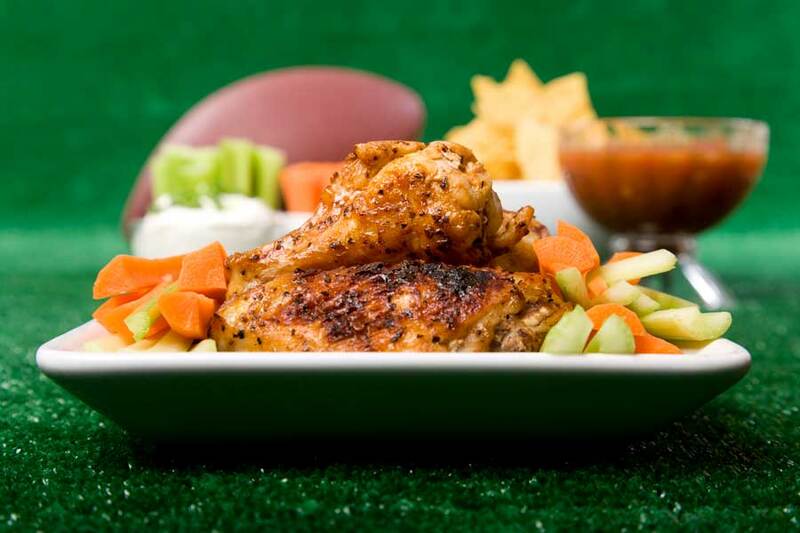 Being conscious about your food choices doesn’t mean you need to disregard some of your favorite game day staples—like buffalo wings. Why not bake them instead or replace the chicken with cauliflower? By ditching the traditional deep fried, heavily buttered variation, you’ll cut back on the calories, sodium, saturated fats and carbohydrates, but still keep that same great spicy taste. Replace your cocktail weenies with a healthy (but equally delicious) alternative—carrots! Perfect for vegans, vegetarians and individuals who just don’t like hot dogs—carrot dogs in a blanket are a heart-healthy, dairy-free option that contain only 40 calories for three. The key to having your favorite football snacks and eating them too? Portion control. By dividing this hearty dip into individual cups, you can cap your calorie count at 230 per serving. Plus, there’s no double dipping, helping you avoid unwanted germs and keeping your immune system at its best, too. Keep your head in the game and don’t let your healthy habits slide once it’s time for the sweet stuff. Nix the heavy cakes and cookies and opt for a sweet treat with fruit—like banana split skewers—instead. The fruity frozen treat can be dipped in chocolate or low-fat yogurt for added flavor.